QSL-2100 RadiometerBiospherical Instruments' Quantum Scalar Laboratory sensors make it possible to accurately measure PAR in aquatic or dry environments. The QSL is available in either analog (QSL-2200) or digital (QSL-2100) output models. 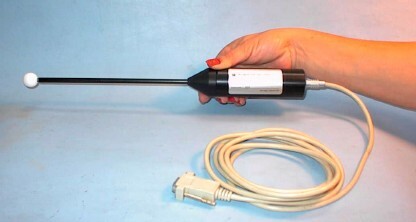 The electronics are miniaturized to fit entirely in the handle of the light pipe and the entire sensor is submersible to 1 m depth for 30 s.
The small size and convenient hand wand ensures that Biospherical Instruments’ QSL scalar sensors provide accurate light measurements from virtually all directions in the field or in the laboratory. The long light pipe is particularly convenient when used in growth chambers for organisms such as photosynthetic bacteria, plankton, kelp, and higher plants. The 1.27 cm diameter collector on the QSL-2100 or the QSL-2200 is specifically designed for insertion in vials of the type commonly used in photosynthetrons. Software. Digital output model QSL-2100 is powered by the serial port of a PC. Software is included with each sensor and is compatible with all Microsoft Windows platforms, including Windows XP, 7, and 8. Data are in a digital format and transferred to the PC or laptop. The user may configure this software to display in quanta or microEinsteins. Irradiance Collector: 1.9 cm (3/4 in) diameter, solid Teflon sphere (QSL-2100 or QSL-2200) optically connected to the detector, filter, and amplifier housing by a 25 cm (10 in) long, 6.3 mm (0.26 in) diameter, non-toxic, fused-resin coated, stainless steel shaft encasing a quartz light pipe. The QSL-2101 or QSL-2201 has a 1.27 cm (0.5 in) diameter, solid Teflon sphere. Photodetector: Blue-enhanced high stability silicon photovoltaic detector with dielectric and absorbing glass custom filter assembly. Spectral Response: Equal quantum response 400–700 nm (PAR, Photosynthetically Active Radiation), response optimized to better than +/–10% over this wavelength range. Individual detector response plot is available an option. Directional Response: Front (0°, head-on) response to side (90°) response equal with some fall-off approaching 180° due to intrusion of the stainless steel casing. Each instrument’s directional response is optimized before spectral calibration. Individual detector directional response plots are available as options. Sensitivity: Nominal sensitivity 1 V = 1.5x1017 quanta/(cm2·s) providing full scale sensitivity to 0.55 µE/(cm2·s). Noise level typically less than 1 mV; temperature coefficient of the dark signal is less than 10 µV/°C, and response temperature coefficient is less than 0.15%/°C. Calibration: Each sensor contains internally embedded calibration factors for both wet and dry measurements. Biospherical Instruments calibrates sensors using procedures and source Standard of Spectral Irradiance traceable to NIST. Power Requirements: QSL-2100 Digital Output: No batteries are required. All power is supplied by the host computer’s serial port. QSL-2200 (Analog) +6 to +18 VDC.